We specialize in working with clients on an individual basis to help you create a unique custom item. These unique works are created for businesses, clubs, individual collections, or movies and television. They are one-of-a-kind works of art, and are not available for purchase like our standard stock designs. A one of a kind custom sword. We worked with the client using their sketches and specifications then added some elements of our own . the hilt and pommel are cast bronze with silver plate. there are 15 blue sapphires, hand carved ebony handle and blue glass sphere. The sword is similar in shape to a Roman Gladius with a total length of only 28"
"Darsus" Custom Sword is not available for sale. This is an example of custom, limited-edition design. A sword created for a customer. Hand sculpted in bronze with silver plate. 18 garnets and 1 moonstone. Central lenses have a bezel mounting and can be removed and replaced. 36" blade is tempered carbon steel. Hilt is 14". Overall length 50"
Animation Sword (Custom) is not available for sale. This is an example of custom, limited-edition design. A one of a kind custom sword. We worked with the client going over multiple designs. 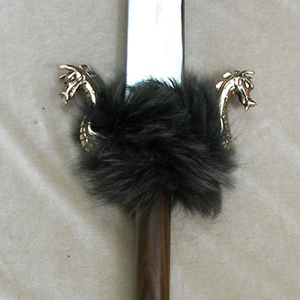 Twin dragons form the hilt that then flow up the hand carved ebony handle and twist into the pommel. The bronze is blackened with brushed highlights and ruby eyes. The pommel has a carved ebony disc on both sides. The blade is A2 carbon steel with a full tang peened past the pommel. 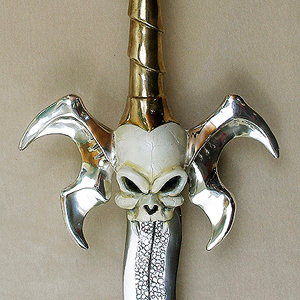 The wide spikes reflect the shape of the hilt. We designed a simple leather sheath but included design elements that reflected those in the sword. 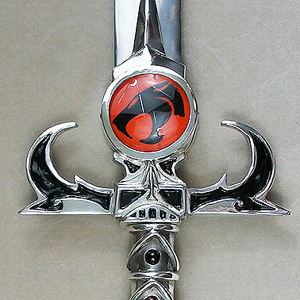 Black Dragon Sword is not available for sale. This is an example of custom, limited-edition design. A custom set created for use in a wedding. A his and hers set of swords with matching shield and hanger. also 4 of our Branch Bolines as gifts for the Groomsmen. The swords have A2 steel blades, 28" long hand ground and tempered with a mirror polish. The hilts are solid bronze with a dark patina to look like wood. The gemstones are green varicite and purple sugalite, both hand ground and engraved with the engraving picked out in gold. The shield is handcrafted steel with leather straps. We designed and painted the front with examples provided by the couple. A special wall hanger was designed to hold the shield and allow the swords to be inserted easily. Branch Sword Set is not available for sale. This is an example of custom, limited-edition design. This sword was created for a catholic school in Indiana. A lot of symbolism went into the overall design. From the hammer and tongs on the pommel to the roaring lion pommel. The blade is large at 37" tempered A2 steel with a double sized fuller. Engraving of school motto goes down fuller. The school logo is in the crest on the hilt with the school colors of blue and silver. The handle is a rich dark brown leather. A matching leather sheath with silver fittings was made to go with the sword. overall length os the sword is 51"
Catholic School Sword is not available for sale. This is an example of custom, limited-edition design. This is a sword designed by the client. We worked closely with him to create exactly what he wanted. Total length 53" with a 38" blade. Differential tapered blade with A2 carbon steel, brush finished. weight is around 12 lbs. Sword has a peened pommel. The balance is 2" from the hilt. All the hilt parts are lost wax cast bronze with silver plate and aged patina. Molded red leather over a wood core handle and sheath. Chain Sword (Custom) is not available for sale. This is an example of custom, limited-edition design. A very unique custom design created to a customers specifications. The blade is made of solid copper 38" long and mirror polished. The hilt parts and handle are similar to a katana style. The handle is covered in polished copper with a traditional leather wrap. The hilt and pommel parts are hand carved in brass. Total length is 4'. Copper Sword is not available for sale. This is an example of custom, limited-edition design. A very unique sword. Basic concept was the customers, we made it beautiful as well as functional. Hardened A2 carbon steel blade, bronze dragons and a black walnut handle. Overall length is 46" balance is at the hilt. Custom Dragon Sword is not available for sale. This is an example of custom, limited-edition design. This is one of those times where a client has a really great concept that they bring to us, we add ideas creativity and expertise and together we create a truly remarkable work of art. The sword is Has a 32" A2 steel blade with full tang. The design of the flames was hand sculpted into the steel on both sides. The Dragons head hilt is cast in bronze with marquise rubies for the eyes. A very unique design allows it to cup and protect the hand. The handle is hard maple with hand tooled leather creating the body of the dragon. 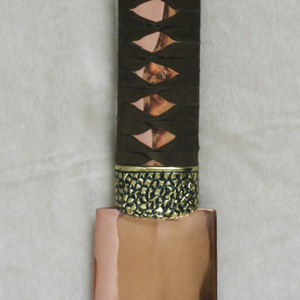 The sheath is hand carved oak covered in tooled leather and repeats the flames seen on the blade in brilliant color. It is a large sword with a total length of 48" and a weight of aprox. 6lbs. Dragon's Fire is not available for sale. This is an example of custom, limited-edition design. A custom sword incorporating our standard wing hilt with a few variations. 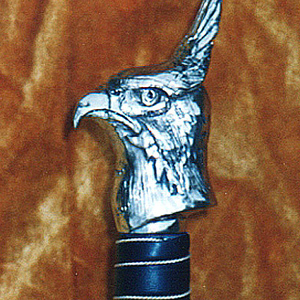 A custom sculpted pommel of the Eagle head was created. This was the family crest. The shape, size and weight of the blade had to be correct. Though a large sword it can be used with one hand. Eagle Wing Sword is not available for sale. This is an example of custom, limited-edition design. A sword we created for the Knights of the Ecor Rouge. We started with our Unicorn sword. Making them into regular horses then created a special pommel that holds a commemorative coin. Other symbols are the water and the wheat like grass that grows in the marshes. Ecor Rouge Sword is not available for sale. This is an example of custom, limited-edition design. A custom sword created for a client following their detailed drawings. All hand carved and sculpted with a lot of detail work. The pommel and crossguard are gold plated with silver and copper foil leaf. There are turquoise gemstones as well as a turquoise inlaid Eye of Horus on the pommel end. the handle is bone with turquoise and the greek key has been hand engraved and filled with gold leaf. There is engraving along both sides of the blade including reproductions of personal signatures. This sword is truly a unique treasure. Egyptian Sword (Custom) is not available for sale. This is an example of custom, limited-edition design. A true flame blade. This is a custom one of a kind work. Made together with the Lightning Sword. We created a sword that looked like moving fire, from the hilt to the blade. Handle is red synthetic mother of pearl. A pear shaped faceted garnet is set in the hilt. Fire Sword Custom is not available for sale. This is an example of custom, limited-edition design. A one of a kind custom sword created for a client. A game sword created with copyright permission obtained from the designer by the client. A2 carbon tool steel blade. Solid bronze hilt with silver plating and enamel paint on hilt. Skull was created hollow to reduce weight. Handle is bronze with wood core. Total length is 45", Blade length 33", handle is 8" Total weight is 10 lbs. Game Sword (Custom) is not available for sale. This is an example of custom, limited-edition design. We were asked to re-create the iconic sword used by Hiro in the original television series "Heroes" for the new series "Heroes Reborn" on NBC. We created an original and a 20% scaled down version as well as sets of aluminum bladed stunt swords, even a version to be used for special effects. These are copyrighted items and are not available for orders or sale. Heroes Sword is not available for sale. This is an example of custom, limited-edition design. Created for a client who wanted a strong and large ceremonial sword. We had previously made a knife for the client with a hilt that would fit their large hands. The sword matches the knife we made. Simple plain hilt of bronze with an ebony handle and a pentacle pommel.A long wide blade is ground and tapered so it can be wrilded with one hand easily. 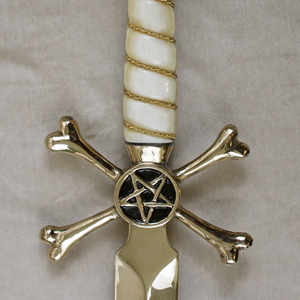 Large Pentacle Sword is not available for sale. This is an example of custom, limited-edition design. Lightning Sword is not available for sale. This is an example of custom, limited-edition design. We incorporated many different visual elements into this sword as requested by the client. The front has a very detailed sculpt of the family coat of arms, the main element being the lion rampant. The lions head was then incorporated into the pommel. On the back side a detailed butterfly was sculpted into the hilt. The blade is 28" spring steel and a molded red leather handle and scabbard finishes it all off. Lion & Butterfly Sword is not available for sale. This is an example of custom, limited-edition design. A custom sword created for a clients wedding. All of the symbols chosen by the client. The broken chain, lions and family coat of arms. A stylized version of King Arthur's Round table is engraved on the blade. The blade is 32" A2 carbon steel with a solid tang and nut cap. Fittings are polished bronze with a simple red lambskin handle. Overall length is 41"
Lion & Chain Sword (Custom) is not available for sale. This is an example of custom, limited-edition design. Created exclusively for the "Hex" Stores in Salem and New Orleans. This sword has a bronze hilt, pommel and a solid bronze 20" blade. Handle is carved bone with bronze wire inlay. Overall length is 27"
Necromancer Sword is not available for sale. This is an example of custom, limited-edition design. A one of a kind unique design created for a client. We designed the hilt to be as much like a real octopus as possible. All 8 legs and a feeling of movement. Detailing all of the suckers on the back side as well. There are green onyx eyes for the octopus and rainbow moonstones on the pommel. The handle has a pattern of ripples under the stretched leather. Both the handle and sheath were dyed a blue and green combination. The blade is A2 carbon steel with a full tang and a nut top.1/4" spine at the hilt tapering to 1/16"at the tip. Overall length of 31"
Octopus Sword is not available for sale. This is an example of custom, limited-edition design. We created these swords for the international game company "Paradox Interactive" The wanted an historical feel to the sword but with their logo and engraving. The swords are being used as an employee 10th anniversary award. The blade is 28" 5160 spring steel, full tang with peened pommel. Leather over wood handle. Total weight of 3.5lbs. Paradox Sword is not available for sale. This is an example of custom, limited-edition design. One of our Phoenix knives reworked for a customer to be a short sword. The hilt was expanded wider to fit the 18" flame blade. A dragon is engraved on the blade, green onyx eyes in the Phoenix. The sheath is matching red dymondwood with a bronze inset of a wolf with two lapis lazuli on either side. Phoenix Customized Short Sword is not available for sale. This is an example of custom, limited-edition design. This was a custom sword created for a dojo in Chicago. 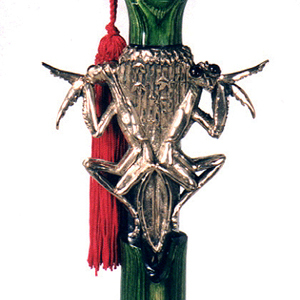 The preying mantis was their logo and they wanted a Thai Chi sword for members incorporating it as a hilt. The green handle is cut and shaped like bamboo. A mantis looks in each direction, every joint and detail is visible in their bodies. The pommel has a disc with Chinese characters, nestled in a grove of bamboo. The sensei's sword had a sphere in the pommel and special characters down the blade. Aprox. 15 swords in all were made made. Praying Mantis Sword is not available for sale. This is an example of custom, limited-edition design. 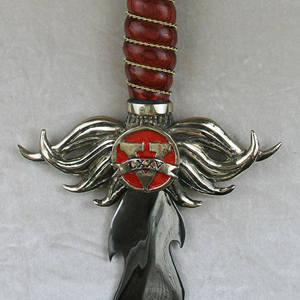 A custom Sword designed to incorporate the Qabalistic Tree of Life. We were given very precise details for size, materials and layout by our client. The handle is black walnut with a quartz sphere mounted free floating in the pommel. The handle itself gets wrapped by the group. The crosspiece has black tourmaline and smokey moonstone gems. The blade is stainless steel with engraved pathways connecting a citrine, amethyst and tigers eye gemstone. The edges of the blade are engraved to represent the black and white pillars. A truly one of a kind work of art. Qabalah Sword is not available for sale. This is an example of custom, limited-edition design. 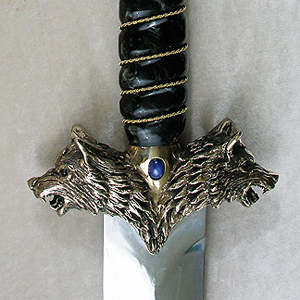 Snarling Wolf Sword is not available for sale. This is an example of custom, limited-edition design. This sword was a special commission for the "Knights" Youth hockey team in Chicago. 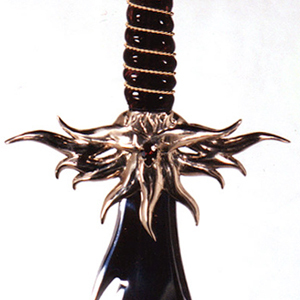 The sword is used as a display trophy and have names engraved down the blade. The pommel is designed to represent the police and firefighters who are supporters of the team. Though only a trophy, we created the sword as the real thing. Bronze fittings and tempered carbon steel blade with full solid tang. St. Jude Sword is not available for sale. This is an example of custom, limited-edition design. A one of a kind creation based on the elements and description provided by the client. A family coat of arms includes the stags head surmounted by the cross and the garter. We incorporated these ideas into the hilt on one side. Having the antlers move out and stwist along the hilt. The other side is covered in celtic knotwork and family motto. The blade is also engraved. One of the largest swords we have ever created at 56" total length. The handle is bog oak several thousand years old. The hilt and pommel have 14 bllodstone gems. The blade is A2 tool steel hand ground and tempered with a full tang The sword is well balanced and can be used with one or two hands. Stag Sword is not available for sale. This is an example of custom, limited-edition design. Star Trek Discovery "Sword of the Emperor"
Created for the CBS show "Star Trek Discovery" We worked from and improved on plans supplied by the studio. The pommel and crosspiece are hollow bronze castings. The handle is carved wood with red lambskin inset with bronze banding. The blade is hand ground aluminum for stunt fighting but with a mirror polish. The sheath is hand carved wood with bronze inlay. This is a copyrighted piece and we will not make any reproductions. Star Trek Discovery "Sword of the Emperor" is not available for sale. This is an example of custom, limited-edition design. A special custom machete. We were asked by the client to create a machete and add all the survival tricks into it we could. It was meant as a retirement gift and though it will be on display probably more than in the wild bush we made sure it would be at home in either. The blade is our A2 steel all hand ground including the saw blade on the spine. The blade has an 18" ruler and several hex wrenches cut into it as well as a good old bottle opener. The handle is oak and contains a watertight compartment with matches, chord and fishing lure. The pommel has an oil compass as well as a removable 5x magnifying glass. The sheath is oak (because that saw blade is sharp!) with a leather covering. Survival Machete is not available for sale. This is an example of custom, limited-edition design. One of two swords we created based on customers preliminary concepts. Falchion style blade 23" long. The guard and pommel has the elements represented in landscape form hand sculpted. 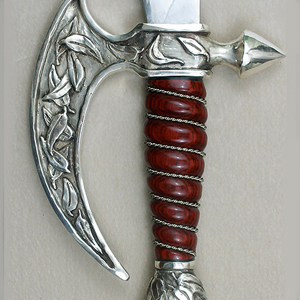 Hilt is silver plated with a red Dymondwood handle. The sheath is black Dymondwood with silver fittings. Overall length 30"
Sword of Elements (Custom Set) is not available for sale. This is an example of custom, limited-edition design. One of two swords we created based on customers preliminary concepts. Falchion style blade 23" long. The guard and pommel has leaves blowing in the wind hand sculpted in relief. 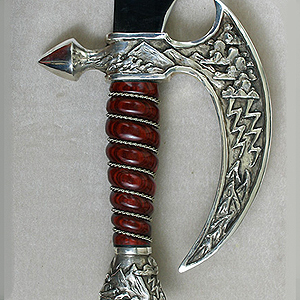 Hilt is silver plated with a red Dymondwood handle. The sheath is black Dymondwood with silver fittings. Overall length 30"
Sword of Wind ( Custom Set) is not available for sale. This is an example of custom, limited-edition design. A very unique sword. A one of a kind custom creation designed based on a clients concepts and ideas. The sword is large and powerful. different elements were brought together, angles, plains, spikes and discs. Everything was designed to come together and be more than the some of their parts and become a functioning sword. The blade is hand ground A2 steel. The hilt and pommel are ccast bronze with silver plate. The hilt is large and wide but cast hollow to reduce weight. The handle has wrapped chains incorporated into the castings and a blue leather grip. A blue faceted sapphire is mounted in the center on the front. Over all length: 44.5" Blade length: 33" Hilt width: 11" Sapphire: 10mm Weight:7 Lbs, balance 2" from grip. The Blue Sapphire Sword is not available for sale. This is an example of custom, limited-edition design. A set of 3 large swords created for the partners of a company. The handles are made of composite gemstone, malachite, lapis lazuli and white turquoise. Full tang A2 steel and a full length of 4 feet. We worked with them to incorporate the look they wanted as well as symbols and engraving that were important to their company and families. Three Partners Sword is not available for sale. This is an example of custom, limited-edition design. A sword of fire for the Vulcan King. Created and designed for the 2012 St. Paul Winter Carnival. The sword has a flame blade made from A2 carbon steel. Hilt and pommel are cast bronze. "Vulcanus Rex" is on the pommel and the roman numerals for the 75th king on the hilt. Total length is 40". A mount is located on back of hilt for a small flash ball ejector. Vulcan Sword is not available for sale. This is an example of custom, limited-edition design. A customized design created for the Auburn University Football Team. We started with our standard Eagle sword, then sculpted a new pommel. The handle is holly wood dyed to match the university colors. Gemstones of Lapis and carnelian surround the pommel. The blade is wide but thin and light. We also made a wood sheath with matching blue leather and bronze fittings. The sword will have names engraved on the blade as the years go by and become a school trophy. War Eagle Sword is not available for sale. This is an example of custom, limited-edition design. This is a pair of highly customized swords we created for a client. We started with our basic Wing hilt design and then changed everything else. The swords are long and wide, we used our A2 steel and kept the blades light and springy, this also allowed the swords to be held one in each hand. The pommel has a special raised design in the center with arabic calligraphy around the circle. 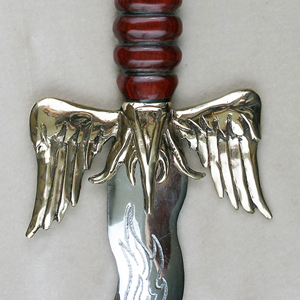 The blades have large wings engraved on both sides as well as latin inscriptions. One wing is white and the other black. For the black wing we used a series of crosshatching to create a texture the white wing was left as simple outline. The end result is a truly powerful work of art..
Wings of the East is not available for sale. This is an example of custom, limited-edition design.